Kossoff’s working environment is of central importance to his output. This is partly because his surroundings have so often provided him with subjects to paint. After moving to a new studio at Willesden Junction in 1961, he embarked on a cycle of paintings which depict the railway lines that ran nearby. Around the corner from his studio, Station Road spans a sprawl of twelve consecutive train tracks. This sprawl is the subject of Willesden Junction. Standing on the road bridge, looking out across this open expanse, Kossoff was able to take in not just the industrialised landscape but also the horizon. Because the railway lines are so wide there, it follows that the horizon is also unusually broad – unbroken by high rises and interrupted only by passing trains. 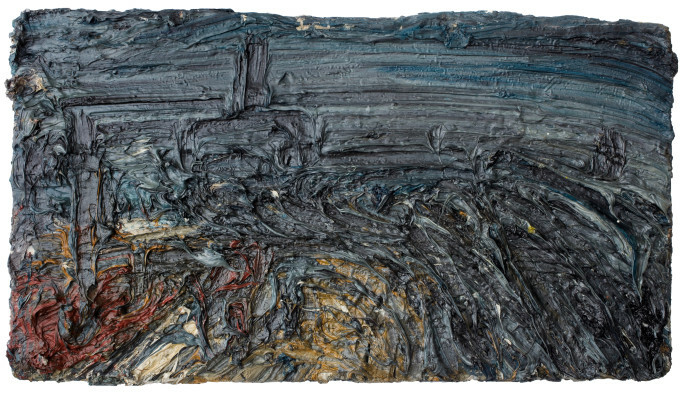 As such, Kossoff was drawn not simply to a bleak expanse of trainyard but also to the simple openness of the skyline, and the opportunity this afforded to watch the dawn. As he wrote later, as work on a subject progresses, ‘[t]he time of day becomes more important – if I do a drawing in the morning then the painting I go back and work upon becomes a ‘morning painting’’. This is not the only painting in Kossoff’s oeuvre to depict Willesden Junction early in the morning. One instance is Willesden Junction (Early Morning) (1962, University of Reading), a work which suggests the light and air of dawn in spring with its high-key palette of grey, pink and yellow. By contrast, the dawn depicted in Willesden Junction is blackened and glowering. Despite the darkened morning, however, Kossoff had started to use bold and non-naturalistic colouring at this time. Accordingly, the sky in this work is shaded in a robust, saturated blue, and the foreground is marked by streaks of orange, red and yellow. These hard, bright colours would not fully emerge in his work until the 1970s, but their presence here indicates how new surroundings and new scenery prompted in Kossoff new creative ideas.